Information: Paul (?-1971) and Gretel (1905-1992) Dunsing, teachers and authors of books about German dances. 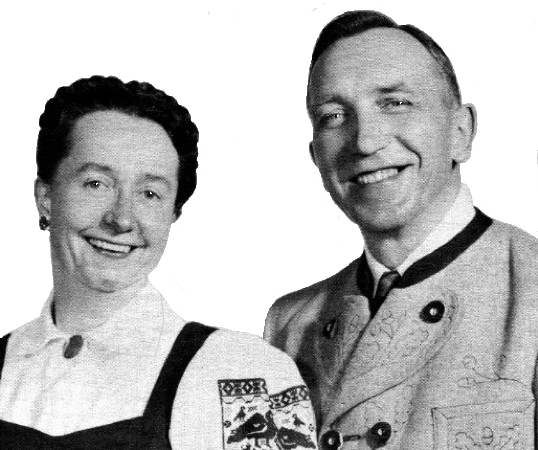 Paul and Gretel Dunsing, born in Berlin, Germany, were responsible for introducing most of the German dances that folk dancers in the United States do today. They were respected early leaders of the United States folk dance movement and as lively and accurate instructors. Gretel Benthin, who was born in 1905, began to dance from the time she learned to walk and often went dancing with her parents. She also danced at her school, where she also did rhythmic gymnastics. Paul, on the other hand, had no dance training until he left school at the age of sixteen. His first training was in a private dance school, where he learned the dance walk, change-step, fox trot, rheinländer, polka, waltz, two-step, and quadrille. He later received a German State Certificate to teach folk dance and rhythmic gymnastics. Paul and Gretel met in the early 1920s when they danced the Swedish Shottis (which became their favorite dance, of course!). In 1925, Gretel came to the United States for a two-year visit, but decided to stay, working in a bank. After staking him to a ticket to America, Paul joined her and they were married in July of 1927. For years, Paul worked in the paper business, while continuing his folk dance and gymnastics after work. He received a Bachelor's Degree in physical education from George Williams College and served as the athletic director at the college for a year. While in Germany, Paul had done extensive work with Harold Kreutzberg, so the Dunsings established a modern dance studio in Chicago, with folk dance and rhythmic gymnastics as a part of their program. Beginning in the late 1930s and continuing for nine years, Paul directed a folk dance group which specialized in German and Scandinavian dances, and with this group, participated in the National Folk Festivals held in Chicago and Washington, D.C.
Paul and Gretel, a pianist and teacher, brought the dance of Germany to folk dancers across the United States at camps, workshops, and seminars. Gretel also taught the playing of the recorder, an eight-holed flute-like wind instrument. Wanting to further his education, Paul received a Bachelors degree in physical education from George Williams College and a Masters degree in Education at Northwestern University. From 1946 to 1954 he directed therapy through physical education at the Veterans Rehabilitation Center (later known as the Mental Health Center) doing therapy through physical education that included square dance, international dance, and rhythmic gymnastics. The couple remained in touch with changing folk dance trends and through many tours of Germany and other European countries, studied the ethnic as well as modern developments in the German folk dance field. Dancers were always grateful to them not only for their concern for their German folk dance as an art, but also for the German folk dance books they produced. He was recreation director at the George Williams College summer camp. In 1954 Paul joined the faculty of the George Williams College and was active there until his retirement in 1970. Paul was one of the first to be hired by the Chicago Park District to teach folk dance as part of their new park curriculum, and in 1935, he helped organize their first large scale Folk Festival. The Dunsings were constantly active in folk dance activities, participating in many workshops and dance camps, such as the Folklore Village Farm Christmas Festival (Mt. Horebt, Wisconsin), Idyllwild Folk Dance Workshop, Lac Sept Islest, Lighted Lantern Folk Dance Camp, Oglebay Institute Folk Dance Camp, Québec Camp (Beckett, Massachusetts), Stockton Folk Dance Camp, and Year End Folk Dance Camp (Keenet, New Hampshire). Although Paul passed away December 12, 1971, Gretel continued her work in folk dance workshops, utilizing various partners where she taught, and recorder seminars until her death at age 87 on March 29, 1992, at the Palms of Pasadena Hospital in St. Petersburg, Florida. The Methodist Church issued a series of records called The World of Fun, featuring the Michael Herman Orchestra and supervised by the Dunsings. These recordings were later reissued by RCA Victor. Other recordings were to follow on the Rondo label. Chicago's 7th International Square Dance, Conrad Hilton Hotel, Saturday, Nov. 3, 1956  a syllabus. A Collection of the Descriptions of Folk Dances as Taught by Paul and Gretel Dunsing, volume 1, 1971. A Collection of the Descriptions of Folk Dances as Taught by Paul and Gretel Dunsing, volume 2, 1972. Dance Lightly, Kit No. 55, by Dunsing, Gretel and Paul. Delaware, Ohio, Cooperative Recreation Service, 1946. Instructions and music for 14 folk dances collected by the Dunsings. German Folk Dances, North Germany, vol. 1. Edited and translated by Paul Dunsing. Leipzig, Germany: Friedrich Hofmeister Verlag, 1936. Instructions and music for 15 dances. Please do not copy large portions without permission from [a href="houston_r.html">Ron Houston.